Easter is only a few weeks away, which means it will be hard boiled eggs galore very soon! My mom always used to set up an egg dying station in the garage with a table full of stickers and all the fun colors! Some years we would tie dye the eggs. Some years we would write on them with that white crayon. Some years it seemed like more dye ended up on us than the eggs, but we always had a blast! Of course, then the whole week after Easter it was a marathon of hard boiled eggs for breakfast and all the egg salad sandwiches we could possibly eat! The worst part was always peeling the eggs. Not only did you end up with dye colored hands, inevitably the shell would stick to the white and we would end up with a very sad looking hard boiled egg. 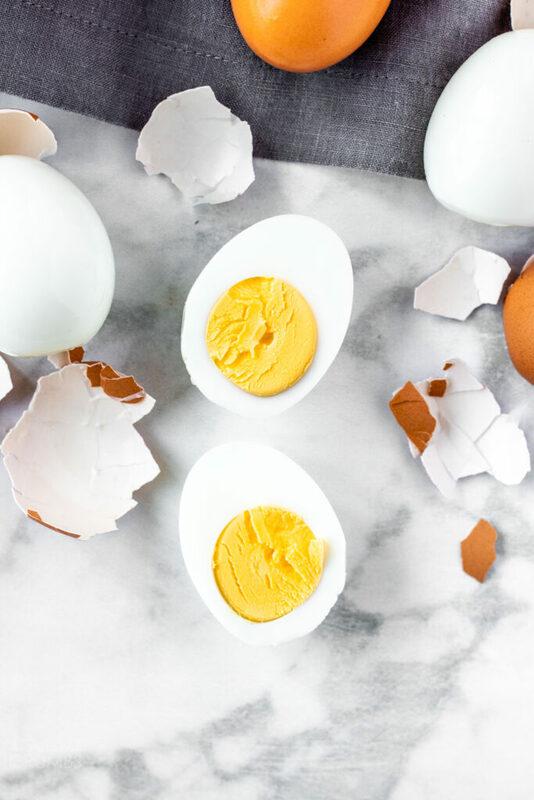 I am here to tell you – perfectly easy to peel hard boiled eggs are possible every time. I have 2 fail-proof methods for easy to peel hard boiled eggs. One involves an Instant Pot, the other, is a simple stovetop method. They both include an ice bath to transfer the hot eggs immediately after cooking. This shock in temperature from hot to cold acts on that white membrane that usually sticks to the egg white, and pulls it away from the egg. Both methods are equally effective, and yield perfectly easy to peel hard boiled eggs. Let’s start with the stove top method because anyone can do it. The biggest trick here is to boil a large pot of water first and carefully lower cold eggs into the pot. Once they cook covered for 15 minutes, carefully transfer them directly into an ice bath. I personally use the Instant Pot method now that I have one. I don’t have to wait for the water to boil, and I can pretty much set it and walk away. 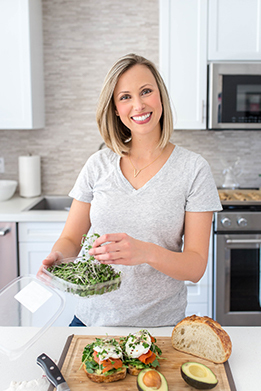 All you need is your Instant Pot, the steamer basket insert, and at least 1 cup of water. Place the eggs on top of the steamer basket, add the cup of water, and seal your Instant Pot. Make sure your steam valve is closed. Set your Instant Pot on manual pressure for 6 minutes and that’s it! Once it comes to pressure, it will start the countdown. When your eggs are done cooking, manually release the pressure, and carefully transfer the eggs to an ice bath. For both methods, allow the eggs to chill completely in the ice bath, about 15 minutes before peeling or storing in the refrigerator. Regardless of the method you choose, I hope you enjoy flawless easy to peel hard boiled eggs! 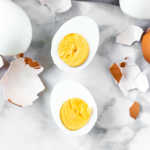 Easy to peel hard boiled eggs 2 ways – with and without an Instant Pot. Place the steamer insert into your Instant Pot. Add 1 cup of water. Arrange eggs on top of steamer and lock your lid. Make sure the steam release valve is on sealing. Cook eggs on manual high pressure for 6 minutes. Remember, it will take some time to come to pressure before the cooking timer starts. Carefully release the pressure valve. Once it is safe to do so, remove the lid, and use tongs to transfer the eggs to the ice water bath. Allow to cool for 15 minutes before using or storing in the refrigerator. Leave eggs in the refrigerator, while you bring a large pot of water to a boil. When the water is boiling, lower the temperature to medium. Carefully lower the cold eggs into the boiling water one at a time. Cover, and allow to simmer (not boil) for 15 minutes. Carefully remove the eggs from the water and transfer to the ice bath. Allow to cool for 15 minutes before using or storing in the refrigerator. Hard boiled eggs will keep in the refrigerator for one week. Peeled eggs should be eaten on the same day.